Question 1: Mr. President, thank you for allowing us to come here. We asked for this interview because your country’s been at war for four years. It is a humanitarian crisis, perhaps the worst on the planet right now. 200,000 Syrians have died, four million refugees, ten million have left their homes, life expectancy is down, 50% of your country is occupied by hostile forces. It’s become a battleground for outside forces. What’s next? Because we have seen since I last visited you the rise of ISIS, we have seen Hezbollah in here, we have seen the United States becoming increasingly concerned about ISIS, so much so that the President, and especially the Secretary of State, have said that there’s a need for a negotiated settlement. President Assad: Actually, the beginning of your question is exaggerating the number a little bit, but that’s not the issue. I always invite the media and the West and the officials to deal with those numbers not as spreadsheets and numbers and counter; actually it’s bereaved families who lost their dear ones. It’s a tragedy that’s been going through, every Syrian family lost someone, lost their livelihood, and so on. Whether it’s a few thousand or hundreds of thousands, it’s a tragedy. What’s next? Actually, every conflict should end up with dialogue, with a political solution between the different parties, and that’s what we have been doing in Syria for the last two years; dealing directly with the militants, and we succeeded in making some reconciliations. Regarding the rise of ISIS, in the context of events in Syria during the last four years, ISIS didn’t rise suddenly. It’s impossible for such – bigger than what we call an organization and smaller than a state – to appear suddenly with all these resources, financial resources, human resources, without support from the outside and without being prepared gradually or incrementally for a long time before the sudden rise during last summer. So, the rise of ISIS is not a precise word because it didn’t happen suddenly; it was a result of events that happened at the beginning of the conflict that we mentioned in our statements many times, but no-one in the West has listened to. If we want to mention the statement of Kerry regarding the dialogue, I would say that we have in Syria so far is only a statement, nothing concrete yet, no facts, no new reality regarding the political approach of the United States towards our situation, our problem, our conflict in Syria. But as a principle, in Syria we could say that every dialogue is a positive thing, and we’re going to be open to any dialogue with anyone including the United States regarding anything based on mutual respect, and without breaching the sovereignty of Syria, and as a principle I would say that this approach, the new approach of the United States towards not only Syria, towards anyone, to make dialogue regarding any issue, is a positive thing, but we have to wait for the reality. Question 2: What kind of communication is there between your government and the American government? President Assad: There’s no direct communication. Question 3: None at all? Question 4: No kind of conversation about what kind of settlement might take place, no conversations about how to fight ISIS? President Assad: Nothing yet. Till this moment, no. Question 6: Would you like to have that happen? President Assad: Any dialogue is positive, as I said, in principle, of course. Without breaching the sovereignty of Syria, especially regarding the fighting of terrorism. The way we defeat terrorism, that’s an important issue for us at this moment. Question 7: But the question is what are you prepared to do? It is your country that is suffering. What are you prepared to do in terms of negotiations? If part of that is to see a transition government, of which you would give up power, would you be willing to do that? President Assad: Anything regarding the Syrian internal politics should be related to the Syrian people, not to anyone else. We’re not going to discuss with the Americans or anyone what are we going to do regarding our political system, our constitution, or our laws, or our procedures. We can cooperate with them regarding fighting terrorism and making pressure on different countries like Turkey and Saudi Arabia and Qatar and some of their allies in Europe that support the terrorists politically and financially and by military means. Question 8: This cannot end militarily. Do you agree with that? President Assad: Yeah, definitely. Every conflict, even if it’s a war, should end with a political solution. Question 9: But then draw me a roadmap that you have for a political solution. What does it look like? President Assad: You have different levels. You have the internal levels, you have the regional, you have the international, and you have different means at the same time. The most important part is the local. The local part should have two things: a dialogue between the Syrians about everything; the political system, and any other details that could be beyond this, about the future of the country, of course. Second, make direct dialogue with the militants as we did during the last two years in order to give them amnesty and to give up their armaments and go back to their normal lives. Question 10: When you say militants, who do you mean? President Assad: Some of them are terrorists, some of them are people who were implicated by the events for different reasons, so, whoever carries a gun and tries to destroy the public infrastructure or attack the people or cause any harm or breach the law in Syria. That’s the militant. Question 11: But so much of the power is in your hands to engage in the process. I mean, if they demand that you step down before they negotiate, that’s unacceptable to you. President Assad: By the militants, you mean? Question 12: No, I mean by the United States, and Russia, and parties to the conversation. President Assad: No external party has anything to do with the future of Syria, with the constitution or president or anything like this. We’re not going to discuss it with them. This is a Syrian issue. Whenever the Syrian people want to change their president, it should be changed right away, in the same day… even if we exaggerate, it should be through a political process, through a constitutional process. That’s how we change presidents, not through terrorism and external intervention. Question 13: Some say that ISIS was the best thing that happened to you, and that even some of the things that you have done have benefitted ISIS, that because of what ISIS has done and because of your fight against the moderates in your country who, in terms of the Arab spring, wanted to see more democracy here. That you, in the effort to crush them, allowed ISIS to grow. President Assad: Let’s go back to what President Obama said in one of his interviews recently; when he said that the moderate opposition in Syria is illusive. That’s very clear by President Obama, and we always said there’s no moderate opposition. So, the rise of ISIS wasn’t sudden, again. The evisceration, the amputation, eating the hearts of the victims started from the very beginning, and even beheading started from the very beginning of the conflicts. It started with what they called moderate opposition, then it continued with al-Nusra, then with ISIS. So, what happened with those three, including ISIS, they attacked military bases, they killed our soldiers, and they destroyed our economy. According to this logic, how could that be the best thing that happened to me? In what logic? To lose? To destroy the country? To kill your supporters and to kill others, and to kill civilians? In what sense could that be the best thing that happened to me or to the government? That’s illogical, that’s unrealistic, that’s unpalatable. Question 14: Again, I come back to the idea of how, now, with the new reality of ISIS, how it’s changed the circumstances. As they have gained in strength, what new changes do you see in attitude towards you and staying and the Syrian government? President Assad: Regarding the West, you mean? President Assad: I think the West has changed its calculations after the rise of ISIS, but that doesn’t mean that they changed their approach to the conflicts in Syria, in Iraq, and in our region. I don’t think they’ve learned the lesson well, and that, as a result, will not change the course of events, because, the very beginning of the problem, from the Western perspective, is to change the system or the president or the government that they don’t like, and they’re still moving in the same direction. That’s why nothing concrete has changed yet; only the appearance and the priority. Their priority is to fight ISIS, but that doesn’t mean that their priority is to get rid of ISIS. Question 16: How can you see the United States cooperate with Syria regarding ISIS? President Assad: There’s no direct cooperation. Question 17: But how do you see the future? President Assad: The future, you mean. In the future, there must be direct dialogue to fight terrorism, because terrorism is on our ground, on our soil, they cannot defeat it without our cooperation, without having our information, because we lived with this and we know the reality and how to defeat it. Question 18: Most people believe there is cooperation unofficially, and it goes through Iraq, and that somehow Syria knows when airstrikes are taking place by the United States, because they get that information from Iraq. President Assad: From another third party, not only Iraq. More than one country told us that they’re going to start this campaign. Question 19: How does that work? President Assad: What do you mean? Question 20: You do you get information? President Assad: In the campaign? President Assad: How does it work on the ground regarding ISIS? Question 22: Yes. How do you get information, about American airstrikes, so that it can coordinate with what you’re doing, so that they’re not bombing Syrian troops. President Assad: Through a third party, and it was very clear that their aim is to attack ISIS, not the Syrian Army, and that is what happened so far. Question 23: A third party means Iraq, and who else? President Assad: Iraq, another country, Russian officials. Question 24: Russian officials, Iraqi officials? Question 25: Communicate to you the American intentions? President Assad: Exactly. In the details that I mentioned now. Question 26: What’s the level of that information? Is it just about airstrikes, is it about other activities on the ground that are taking place? President Assad: No, no details, only the headlines, and the principle that they’re going to attack ISIS in Syria and Iraq during the next few days. That is what we have heard, nothing else. Question 27: When you shot down an American drone, did you know it was an American drone? President Assad: No, because any drone, any airplane, any aircraft, will not tell you that “I’m American.” So, when you have a foreign aircraft, you shoot it. These are the rules, the military rules. Question 28: How much of benefit are you getting from American airstrikes in Syria, reducing the power of ISIS? President Assad: Sometimes it could have local benefits, but in general if you want to talk in terms of ISIS, actually ISIS has expanded since the beginning of the strikes, not like some Americans want to sugarcoat the situation as to say that it’s getting better, ISIS has been defeated, and so on. Actually, no, they have more recruits. Some estimate that they have 1,000 recruits every month, in Syria and Iraq, they are expanding in Libya, and many other Al Qaeda-affiliated organizations have announced their allegiance to ISIS. So, that’s the situation. Question 29: How much territory do they control in Syria? ISIS controls how much territory, 50%? President Assad: It’s not a regular war, you don’t have criteria. It’s not an army that makes incursions. They try to infiltrate any area when there’s no army, and when you have inhabitants. The question is how much incubator they have, that is the question; how much hearts and minds they won so far. Question 30: How do you measure that? President Assad: You can’t measure it, but you can tell that the majority of the people who suffered from ISIS, they are supporting the government, and of course the rest of the Syrian people are afraid from ISIS. I don’t think they win; I think they lost a lot of hearts and minds. Question 31: They’ve lost a lot? President Assad: They have lost, except the very ideological people who have Wahhabi states of mind and ideology. Question 32: Explain to me why are people fleeing to go to refugee camps in Jordan and Turkey. What are they fleeing from? The Syrian Army? Question 33: I have interviewed some of them in the Jordanian refugee camps, and they were fearful of the Syrian Army. And they were fearful of repercussions if people knew they were being interviewed, so they were reluctant to give their name and where they were from, but they had fled in fear of the Syrian Army. President Assad: That could happen. Of course, you have different kinds of people, you have different perceptions, you have that perception. We don’t say that everybody fled just because of the terrorists. Some people fled just because of the situation, not from the Syrian Army not from the terrorists, they want to go to a safer place. So, they have different reasons for the refugees. Question 34: There is another number that is alarming to me. It is that 90% of the civilian casualties, 90%, come from the Syrian Army. President Assad: How did you get that result? Question 35: There was a report that was issued in the last six months. President Assad: Okay, as I said earlier, the war is not a traditional war, it’s not about capturing land and gaining land; it’s about winning the hearts and minds of the Syrians. We cannot win the hearts of the Syrians while we are killing Syrians. We cannot sustain four years in that position as a government, and me as a president, while the rest of the world, most of the world, the great powers, the regional powers, are against me, and my people are against me. That’s impossible. I mean, this logic has no legs to stand on. This is not realistic, and this is against our interest, as a government, to kill the people. What do we get? What is the benefit of killing the people? President Assad: Let me fully answer this, this is very important. This is part of the malicious propaganda against Syria. First of all, the chlorine gas is not a military gas, you can buy it anywhere. Question 37: But it can be weaponized. President Assad: No, because it’s not very effective, it’s not used as a military gas. That’s self evident. Traditional arms are more important than chlorine, and if it was very effective, the terrorists would have used it on a larger scale. Because it’s not very effective, it’s not used very much. Question 38: Then why not let somebody come in and inspect and see whether it was used or not? Question 39: You’d be happy for that? President Assad: Of course. We always ask that a delegation, an impartial delegation, to come and investigate, but I mean logically and realistically, it cannot be used as a military. This is part of the propaganda, because, as you know, in the media, when it bleeds, it leads, and they always look for something that bleeds, which is the chlorine gas and the barrel bombs. This is very important, the barrel bombs, what are barrel bombs? They say barrel bomb as a bomb that kills people indiscriminately, because it doesn’t aim. This is not realistic for one reason: because no army uses a bomb that doesn’t aim, and the proof to what I’m saying is that, you don’t talk about the shape of the bomb to call it a barrel or cylindrical or whatever. The state-of-the-art drones, American drones, in Pakistan, Afghanistan, in Yemen, with state-of-the-art precision missiles have killed more civilians and innocents than killing terrorists. So, it’s not about this bomb that doesn’t aim, that kills people indiscriminately; it’s about the way you use it. Question 40: But you’re acknowledging then that you do use it? You do use barrel bombs? President Assad: No, no. There’s no such thing called barrel bombs. You have bombs, and any bomb is about killing, it’s not about tingling people. Question 41: Most people understand what a barrel bomb is. I mean, they understand how it’s put together, what’s put inside of the barrel, and they understand how it’s dropped from helicopters. President Assad: No, we have had a very good military industry for years, for decades, in Syria. We don’t have to make bombs, very primitive ones, very malicious ones. This bomb, this term, was used only to demonize the Syrian Army. That’s it. This is part of the propaganda. Question 42: If barrel bombs were used by the Syrian Army, would you order the Syrian Army to stop using barrel bombs? Question 43: It’s a bomb that inflicts terrible civilian casualties. President Assad: Any bomb and missile and even bullet is made to make casualties, but not civilian. There’s no military means made in order not to kill. But how you use, it’s again about the way you use it, it’s not about the bomb. I mean, if you want to talk about casualties, that’s another issue. Every war is malignant, every war is bad. You don’t have benign war. That’s wars are bad because you always have casualties. That is not related to certain kinds of bombs or bullets or whatever. This is completely another issue. Question 44: So in fact, are you denying that barrel bombs are being and inflicting great casualties. President Assad: Again, I always say, we use a bomb, we use missiles, we use everything, we use bullets. You don’t describe what we use by the shape, whether it called barrel, spherical, cylindrical missile, you don’t describe it this way. You use armaments, if you have casualties, it’s a mistake that could happen in every war, but you aim always to kill terrorists, not to kill your people, because you have support by your people, you can’t kill them. Question 45: But you acknowledge that they come from helicopters, barrel bombs. President Assad: No, no. You can throw bombs by any airplane. You can throw them by missile. You don’t have to use helicopters, you can use them anyway you want. Question 47: But, if I hear you correctly, you acknowledge that barrel bombs are being used, but they’re like other bombs in your judgment, and they are not necessarily any different than other weapons. That is what you seem to be saying. President Assad: We don’t have a bomb that is called barrel bomb. This came from the media, we don’t have it. What you call our bombs, that is related to the media. And that is used by the militants, then adopted by the West, in order to demonize the Syrian Army. We don’t have something barrel bombs that kill indiscriminately. If you have a strong bomb or weak bomb, or whatever, I mean you could call it whatever you want. I mean, we have regular bombs, traditional armaments. That’s what we have. Question 48: What do most people consider barrel bombs more brutal than others? President Assad: You have to ask the one who created that term, as I said, for the media, for the propaganda. This is part of the propaganda. If you want to refute the propaganda that’s been going on for four years, you have many things to refute. Question 49: You have often spoken about the danger of a wider war in the Middle East. Let me talk about the parties involved, and characterize how you see them. Let me begin with Saudi Arabia. President Assad: Saudi Arabia is an archaic autocracy, medieval system that is based on the Wahhabi dark ideology. Actually, I say it’s a marriage between the Wahhabi and the political system for 200 years now. That is how we look at it. Question 50: And what is their connection to ISIS? President Assad: The same ideology, the same background. Question 51: So ISIS and Saudi Arabia are one and the same? President Assad: The same ideology, yes. Question 52: The same ideology. President Assad: It’s the Wahhabi ideology. Their ideology is based on the books of the Wahhabis in Saudi Arabia. Question 53: So you believe that all Wahhabis have the same ideology as ISIS. President Assad: Exactly, definitely. And that’s not just by ISIS; by al-Qaeda, by al-Nusra. It’s not something we discovered or we try to promote. I mean, they use the same books to indoctrinate the people. Question 54: What about Turkey? President Assad: Turkey, let’s say, it’s about Erdogan. He’s a Muslim Brotherhood fanatic. That doesn’t mean that he’s a member, but he’s a fanatic. Question 55: President Erdogan is…? President Assad: A Muslim Brotherhood fanatic. And he’s somebody who’s suffering from political megalomania, and you think that he is becoming the sultan of the new era, of the 21st century. Question 56: You think he could stop the border if he wanted to? President Assad: Yes, of course, definitely. He doesn’t only ignore the terrorists coming to Syria; he supports them logistically and militarily, directly, on daily basis, and if you take the example of Kobani, what you call Kobani, we call it Ayn al-Arab, the city where the Kurds were fighting ISIS and where the campaign started, the American military campaign started there. It took them four months to liberate that small city, not only because the airstrikes were cosmetic as we said, but because of the direct support of the Turks to ISIS. Question 57: They were supporting them directly? Question 58: You were quoted as saying that the Syrian Army could have eliminated ISIS in Kobani in three weeks. President Assad: Actually, similar cities with the same terrain and the same size were liberated in a few weeks, without even using the airstrikes. Question 59: Why have you spent more time attacking Aleppo than Raqqa? President Assad: We didn’t attack Aleppo. We try to get rid of the terrorists everywhere. Question 60: Were they terrorists in Aleppo, or were they moderates? President Assad: In Aleppo? No, you don’t have any moderate militants in Syria. Question 61: No moderate militants in Syria? So the definition of a terrorist is what? President Assad: Of terrorism? Whenever you hold a gun, and kill people, and destroy public buildings, destroy private properties, that’s terrorism. Question 62: So, anyone who opposed your government in Syria, and used military tactics, was a terrorist. President Assad: With military tactics, or without? President Assad: The word opposition, everywhere in the world, including your country, is a political opposition. Do you have military opposition in the United States? Would you accept it? You wouldn’t, and we wouldn’t. No-one accepts military opposition. Question 64: It’s one thing to say to say there’s military opposition. It’s another thing to call them terrorists. President Assad: Military opposition is terrorism. Whenever you hold a gun, a machinegun, and you try to destroy and kill and threaten, this is terrorism, by every definition in the world. It’s not my definition. Whenever you want to make opposition, it’s going to be political opposition, like your country, you have the same criteria, we don’t have different criteria from the one you have in the United States or in Europe or anywhere else. Question 65: If there’s a negotiation, would you accept as part of the negotiation and share power in Syria with anyone who is in opposition to you now, whether they are moderates, whether they are terrorists, but if in fact they lay down their arms and say we want to be part of a future government, a transitional government, in Syria? President Assad: Whenever they lay down their arms, they’re not terrorists anymore. President Assad: ISIS will not. This, how to say, virtual. For ISIS to lay down their arms, this is virtual, because their ideology is they want to fight and to be killed and to go to heaven, to go to paradise. That’s how we look at it. They won’t negotiate anyway. So, we don’t have to answer something which is virtual, not realistic. The realistic one is that many of the militants laid down their arms and are working with the government now. This is reality. I’m not talking about what is going to happen in the future. That is happening, and that is part of the reconciliations. Some people are interested in politics, they can take that track, and some people are interested only to going back to their normal lives and work any job, not being part of the politics. Of course we are open. Whenever there is political opposition, we are fully open to deal with them. Question 67: As you know, Secretary Kerry has called you a brutal dictator. Secretary Kerry! Other people have said worse. Does that bother you? Is that an accurate description of you? President Assad: You want the rest of the world to know the reality, of course you won’t be happy to hear something that is a far cry from the reality, but at the end, this kind of description to an official wouldn’t be really important unless the Syrian citizens said this word. And because the Syrian people still support you, it’s a dictator, killing your people, and have the support of the people. It’s a contradiction. Question 68: It’s interesting to have that conversation, but with respect, it is said that there was a time, several years ago, in which you were in a very difficult place, and some people thought the government might fall, even suggestions that you were planning to leave, and then the Iranians came in, and Hezbollah came in, and the tide began to turn. Is that a fair appraisal of the circumstances? Because if it’s true, it means that the Syrian people were not supporting you, because before foreign forces came in, you were about to lose. President Assad: First of all, the Iranians never came in during the conflict. Never. Question 69: General Suleimani was here, in Damascus. President Assad: You have cooperation, as America, with different countries. You send experts, you have a kind of cooperation. That’s different from sending troops. Is that correct? Different, sending troops is different from having cooperation on higher levels. President Assad: No, what you mentioned, I mean your question implied that Iranians are fighting in Syria. That’s completely incorrect. Not correct, definitely. If they come here, we would announce, we don’t have a problem. We have the right to bring allies to fight with us. At the same time, we announced that Hezbollah is in Syria, we didn’t deny this. So, why deny Iran and not deny Hezbollah? We don’t. President Assad: If you have a real Arab spring today, neither Iran nor Russia, not even Hezbollah can help you. The difference in the situation that you mentioned earlier, between the beginning of the crisis and today, is that we are more gaining support by the Syrian people, because they discovered the truth. At the very beginning, many people weren’t… I mean the vision wasn’t clear for many Syrians. Now, it’s very clear, and we have support even from many people in the opposition against terrorism. So, the main factor, why the situation has changed, is not Iran or Hezbollah; it’s the Syrian incubator, the Syrian population. That was the difference. Hezbollah is not a big army. It cannot play that role all over Syria. Question 73: But the game on the ground didn’t change until they came here. President Assad: No, that’s not true. Question 74: So you didn’t need them? President Assad: No, we needed them, of course. That’s alliance, we need them. They play an important part. But what has changed, the balance that you mentioned, when you talk about 23 millions in Syria, when you have Arab spring, let’s say a few thousand fighters from Hezbollah wouldn’t change the balance. What has changed the balance is the incubator that moved toward the government. That is what has happened. Question 75: Here is what is also clear, that even though Secretary Kerry has suggested you are part of the problem or part of the solution, and they want you to be part of the solution, but they have not yet changed their mind that you have to agree to share power or give up power. They don’t want you in power. President Assad: First of all, they didn’t try to make negotiations or dialogue with us, so they don’t know what we want. Question 76: That’s why I’m here. See, that’s why I’m here, to have you tell me what you want, that’s exactly why I’m here. Tell me what you want. Question 77: But the Syrian people supporting you, you have a relationship with them, you know what they want. So what do you want? Question 78: So what do you mean by sharing power? President Assad: I mean if you want to go back to constitutional procedures, they should go to elections, they can share in the parliament, in the local administration, in the government, in everything, and to be part of the decision in the government, like any country. Question 79: You, and your father, have held power in Syria, for how many years? The combination, of you and your father, how many years? Question 80: Well, it does matter. President Assad: No, what matters for us is do the Syrians support these two presidents? Doesn’t matter if they are father and son. We don’t say George W. Bush is the son of George Bush. It’s different. He’s president, I’m president, he had support from that generation, I have support from these generations now. That is the question. It doesn’t matter how many… it’s not the family rule, as you want to imply. President Assad: No, it’s not. It’s not a family rule. It has nothing to do with me being president. When he died, I was nothing. I was just in the army. I wasn’t, let’s say, a high-ranking official. Question 82: You know your family much better than I do, but conventional wisdom is after your older brother died, your father wanted you to come back, because he wanted you to be able to assume power when he left. President Assad: Actually, the reality is the opposite; he wanted me to stay as a doctor and go back to London and I refused. That’s the reality. Question 83: He didn’t want you to come back? President Assad: No, never. He didn’t want me to be part of the politics. Question 84: Then why did you become part of the political process when you were a doctor? President Assad: We live in a political family, we live in a political environment, and in the army, I’m a doctor in the army, and the army during the history of Syria has made the history and the reality in this country. Question 85: Because he was such a significant political figure in the Middle East, would he have done things differently, if he was President of Syria today? President Assad: That’s a virtual question, I cannot answer on his behalf. That’s a virtual question, nobody knows. Question 86: You think he would agree with what you have done? President Assad: Definitely. He wouldn’t allow the terrorists to take over, wouldn’t obey or submit to external intervention. And he would have defended his country like he did during the Muslim Brotherhood. The same happened on a smaller scale in the eighties, late seventies, early eighties, when the Muslim Brotherhood started assassinating, killing, and destroying, and burning, and he fought them. That is his mission as a president. That’s what you have to do. To leave terrorists killing your people, that’s your mission? Question 87: Is it a fair appraisal of what you believe, that everything must be done, and the ends justify the means to stop terrorism in Syria, as you define it? President Assad: No, it’s not the ends justify the means, this is a Machiavellian principle. You should have values and principles. You have constitutions, and you have interests. So according to your values, you have to defend your people, the population, the Syrian citizens, you have to defend your country. For your interests, you have to get rid of terrorists. So, that’s how we think, not only in a Machiavellian way. Question 88: Tell us what the Russians want. They are a strong ally of you. What do they want? President Assad: Definitely, they want to have balance in the world. It’s not only about Syria; it’s a small country. It’s not about having huge interests in Syria, they could have it anywhere else. So, it’s about the future of the world. They want to be a great power that has its own say in the future of the world. Question 89: And what do they want for Syria? President Assad: Stability. They want stability and a political solution. Question 90: And what does Iran want. President Assad: The same. Syria and Iran and Russia see eye-to-eye regarding this conflict. Question 91: And what is your obligation to both of them? President Assad: What do you mean, obligation? Question 92: What you owe them. President Assad: Yes, I know, but they didn’t ask for anything. Nothing at all. That’s why I said they don’t do that for Syria; they do it for the region and for the world, because stability is very important for them, because if you have conflicts here, it will burn somebody else there. If you want to talk about terrorism, terrorism has no boundaries. It sees no borders, no political borders. It’s much more difficult to take any procedure to face it due to the internet, which is difficult to control. When you have ideology, it could cross everywhere, it could reach Russia, it could Turkey, anywhere. So, they have the same interest. Russia, and Iran, and many other countries that support Syria, not because they support the president, not because they support the government, but because they want to have stability in the region. Question 93: Let me present an alternative argument which the Untied States may very well believe, that they support you because they had a longstanding relationship. They support you because they want access to Lebanon. They support you because it’s part of the larger conflict between Sunni and Shi’a. President Assad: You mean the Iranians or the Russians? Question 94: The Iranians, and because they’ve supported you militarily and financially. President Assad: No. The way the Iranians look at the Shi’a-Sunni issue or conflict, is that this is the most detrimental thing that could happen to Iran. Question 95: To Iran? This conflict is the most detrimental thing? President Assad: Anything related to Sunni-Shi’a conflict is detrimental to Iran. That’s their point of view, and that’s how we see it. We agree with them. So, actually they are going the other way. They want always to have reconciliation, unification between the Muslims, because that’s very good for Iran. They don’t want to be part… they don’t look at the issue in Syria as a part. They know that Saudi Arabia, the Wahhabis, they want to instigate this conflict, in order to bring more of the Muslims to their side. Question 96: As you know, there are many people who look at the Middle East today beyond Israel, and say within the Islamic world, it’s all about the conflict between Saudi Arabia and Iran, and choose your sides. President Assad: That’s what the Israelis want to promote. Question 97: No, some analysts look at the Middle East today and say, it is a competition between Iran on the one hand, Shi’a nation, Iraq, Shi’a, you here, Sunni majority, and Saudi Arabia. These two are mortal enemies, fighting for influence in the Middle East. President Assad: That’s not precise for one reason, because it looks like Iran wants to attack the Sunni and Saudi Arabia wants to attack the Shi’a. It actually started with Saudi Arabia after the revolution in Iran in 79. So, it didn’t start from Iran. Iran never interfered in any other nation’s internal issues, including Syria. We have good relations with them, they never tried to interfere. Actually, it’s Saudi propaganda. I mean the whole issue of Sunni-Shi’a conflict is a Saudi initiative and propaganda. It’s reality, but because of the Saudis, not because of the Iranians. Question 98: But in Syria, they are on opposite sides, Saudi Arabia and Iran are on different sides. President Assad: That’s what Saudi Arabia wants to promote, and that’s what ISIS wants to promote, and that’s what al-Nusra wants to promote. In their political discourse, they always mention the sectarian issues. Question 99: I’m now talking about how you see, here, the region and what is happening now. One, is the rise of ISIS here, the rise of ISIS and affiliated groups in Iraq. When you look at Iraq, Iranians are supporting Shi’a militia in Iraq, and they’ve been a very effective fighting force. The United States is engaged in airstrikes. They just had an airstrike yesterday in Tekrit which the Iranian militias have captured, correct. President Assad: Not everything is correct. It’s not only Shi’a militia who are fighting. Many others joined, so it’s a mixture now. Question 100: What’s the possibility of Iranian-American cooperation? President Assad: Regarding fighting ISIS? President Assad: I don’t think anyone trusts or believes that the American administration wants to really fight this kind of terrorism, because, I mean if you look at the airstrikes in Syria and Iraq, the whole 60 countries launch much less airstrikes than only the Syrian Army does on the daily, much less, so they’re not serious. Second, they only attack the northern part of Iraq. I mean, they attack the terrorists in the northern part of Iraq, not the rest of Iraq. Why did they join now? They want to get part of the cake, if there’s a victory against the terrorists, just to say that we fought terrorists and we defeated ISIS? Where were they during the last few months? They suddenly wanted to attack? Question 102: So what do you think Iran wants in Iraq? President Assad: They want to get rid of the terrorists, definitely, and to have stability. Question 103: How long do you think that will take? President Assad: Nobody has any idea, because you know, you have support from the outside, you have the support of the petrodollar, of ISIS, and many extremists in Iraq, and in Syria. So, how long that support will continue, we cannot tell. Question 104: When you look at the future, and you look at the battle ahead, what the end result to Syria? How much of this can Syria take? How much of the conflict that is here today can the Syrian government withstand? How much, the Syrian country, the civilian loss? Will there be anything left in Syria? President Assad: Of course, Syria is still here. It’s not the first kind of crisis that we’ve been facing here in history. Question 105: But nothing like this. President Assad: No, during the history, you have many similar crises. Damascus and Aleppo have been destroyed many times, but, I mean, it’s about the population. The Syrian population are determined to survive and to protect their country, and to rebuild it. How much do we tolerate? That is about the potent power that every population has, and the Syrian people proved that they have strong potential in that regard. Anyway, we don’t have any other option. What option do we have? Whether we suffer, whether we pay a high price or a lesser price, what options do we have but to defend our country, but to fight terrorism. We don’t have any other option. Question 106: I asked the question because many asked it; what’s the cost to Syria, what it’s going through, and how to put the pieces together? Whenever there is finally, an end this, how will you put the pieces back together, and who will put the pieces back together? President Assad: There’s a misconception in the West that what’s happening in Syria is a civil war. This is where you can ask that question. What is happening in Syria is not a civil war. When you have civil war, you should have, how to say, clear lines separated between different sects or ethnicities or different components. That’s not what we have. What we have are terrorist-infiltrated areas, and people are suffering from the fighting and from the terrorism of those terrorists. So, you don’t have division in the society now. You don’t have the sectarian issue now. Actually, you’d be surprised if I tell you that the sectarian situation in Syria today is better than the sectarian situation, let’s say, before the crisis. People are more unified now regarding the conflict, regarding the unity of the sects, religions, and so on. So, we cannot talk about how can you rebuild, let’s say, the society. The society is suffering from the humanitarian aspect of the problem, but it’s not divided anymore, and that’s very important, and that’s why we’re assured, that, I mean, even this conflict, which is a very bad conflict, as you say, every cloud must have a silver lining, and this is the silver lining in this crisis, that the population is more unified now. So we don’t have a problem as long as the society is unified and homogenous, regardless of some dark part of this society, ideological corners in our society that support the Wahhabis, support ISIS, and support the extremists, but this is not the general situation in our society. Question 107: Why do you think that they, people in the West, question your legitimacy? President Assad: This is intervention in Syrian matters. I don’t care about to be frank, I never care about it as long as I have the public support of the Syrian people, that’s my legitimacy. Legitimacy comes from the inside. But why? I will tell you why, because the West is used to have puppets, not independent leaders or officials in any other country, and that’s the problem with Putin. They demonize Putin because he can say no, and he wants to be independent, and because the West, and especially the United States, don’t accept partners. They even accept followers. Even Europe is not a partner with the United States. Best to be very frank with you. So, this is their problem with Syria. They need somebody to keeping saying yes, yes, and a puppet, a marionette, and so on, somebody they can control by remote control. Question 108: There are those who argue that you feel now that you’re militarily stronger, that the advent of Hezbollah and Iranian advisors and American airstrikes and coalition airstrikes, that you feel militarily stronger, and therefore you’re less willing to negotiate. President Assad: Any war can deplete the strongest power, even the United States. When you go to war, you will be depleted in every sense of the world, and we are a small country, we’ll be depleted more than a great country. So, you cannot say that you are militarily powerful, this is again the reality, but you can say that you are politically powerful, because when you win the hearts and minds of the people, more support from the population, this is where you become more powerful. So, what we achieved militarily, not because we are stronger militarily; because we have more support. Question 109: And how much do you believe you may have some opportunity to win the minds and hearts of the Syrian people because they fear ISIS more than anybody? President Assad: We cannot ignore this reason. Question 110: Then ISIS has changed the circumstances? President Assad: We cannot ignore that factor, we cannot ignore it. We don’t say no, this is a factor, but there are other factors. When you’re transparent with the citizens, with the people, when you’re patriotic, you work for their interests, they will support you even if they disagree with you politically. So, we don’t have support now from the traditional supporters. We don’t have support because they don’t oppose us. We have opposition who oppose our government in many aspects; economy, politics, political systems, and so on. But they know that we are working for this country, and when you have a war, it’s time for unity, not time for division for recriminations and so on. That’s why I said we can have more support, and we already had it recently. Question 111: What circumstances would cause you to give up power? President Assad: When I don’t have the public support, when I don’t represent the Syrian interests and values. Question 112: And how do you determine that? President Assad: I have direct contact with the people. Question 113: So, you determine whether they support you? 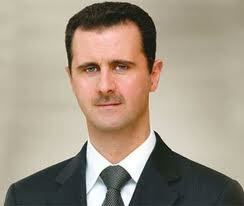 President Assad: No, I don’t determine; I sense, I feel, I’m in contact with them, I’m a human. How can a human make a direct relation with the population? I mean, the war was a very important “lab” for this support. I mean, if they don’t support me, they could go and support the other side. They didn’t. Why? And that’s very clear, that’s very concrete. Question 114: Some have argued to me that the majority of Syrians support neither the government nor ISIS. President Assad: Some that don’t support either? If you don’t, I mean this is like saying that ISIS is like the government. I don’t think that this is realistic. Even people who oppose the government, they oppose ISIS, that’s how we look at it. President Assad: Because very simply, they cannot put the government and ISIS on the same level, so it’s not difficult for them to choose. They didn’t choose… I mean, not to support the government doesn’t to support ISIS. It means automatically they’re going to be with the government against ISIS, but not with the government in other issues. It’s opposition, I mean, you have points of view, but as I said, it’s not time for division. Now, you support the government. When you get rid of ISIS, then you oppose the government in your own way, you use political means. But you cannot compare a government with the terrorists. Question 116: Which raises the question: can you destroy ISIS without coming together with a united plan, a common purpose? President Assad: On the local level, you are correct. You cannot destroy terrorists, not only ISIS, you have al-Nusra Front, which is as dangerous as ISIS. You cannot destroy them unless you are unified as a society. But, again, ISIS now is not the Syrian case. ISIS is in Syria, Iraq, and Libya. So, it’s not enough to be unified on the local level; it’s on the regional level and on the international level, something we don’t have yet. That’s why defeating terrorism is going very difficult because of that situation. Question 117: Something we don’t have yet. So, that’s the question: you don’t have it yet, and how do you get it? Because that’s the future. President Assad: You are talking about more than one party. You are talking about the international parties, first of all the United States, regional parties, first of all Turkey which is our neighbor and plays a very negative role, Saudi Arabia, and Qatar, and the local parties. We would like to see this cohesion in fighting terrorism, but how can we convince them? We tried, maybe not directly, because we don’t have any direct channels with them, but that’s how it should be. If they could see the reality and the future in clearer vision, they would make dialogue with every country including Syria, not because they support the Syrian President or the Syrian Army, we don’t need their support internally; it’s about only fighting terrorism. You need to make dialogue. You cannot kill them and defeat them from the air. That’s a foregone conclusions. Question 118: That’s true in Iraq or here, you can’t do it from the air. President Assad: Anywhere, no you cannot. Question 119: Do you want to see another conference, like the Geneva conference that failed? President Assad: Yes, that’s the aim of Moscow conference. The next one. Question 121: And what might happen there? President Assad: Sharing power, that’s in the constitution anyway. I mean, sharing power is about how much grassroots you have, how much of the Syrians you represent. You don’t come and share power just because you want to share power. You should have public support. Question 123: You have to be a forced to share power. President Assad: Exactly, exactly, you have to represent them. So, maybe if we reach a conclusion and we reach agreement in Moscow, it could be as preparation to go to Geneva 3, for example, but it’s still early to tell. Question 124: I came here after Secretary Kerry made his remarks. My impression once I got here is that when you heard those remarks, you were optimistic. The State Department backed a little bit, and said we still think there needs to be a new government, but you were optimistic after you heard that. You believe there is a way for your government and the American government to cooperate and coordinate? President Assad: That’s not the main point. I mean, regarding that statement. I think the main point, we could have a feeling, and we hope that we are right, that the American administration started to abandon this policy of isolation, which is very harmful to them and to us, because if you isolate a country, you isolate yourself as the United States from being influential and effective in the course of events, unless you are talking about the negative influence, like making the embargo that could kill the people slowly, or launching a war and supporting terrorists that could kill them in a faster way. So, our impression, let’s say, we are optimistic, more optimistic. I wouldn’t exaggerate. That at least when they’re thinking about dialogue, doesn’t matter what kind of dialogue, and what the content of the dialogue is, and even doesn’t matter what their real intentions are, but the word “dialogue” is something we haven’t heard from the United States on the global level for a long time. Question 125: But you just did, from the Secretary of State: we need to negotiate. That’s dialogue. President Assad: Exactly, that’s what I said. I mean, that’s why I said it’s positive. That’s why I said we’re more optimistic. I mean, when they abandon this policy of isolation, things should be better. I mean, when you start dialogue, things will be better. Question 126: Why don’t you reach out to Secretary Kerry and say, let’s talk. President Assad: Are they ready to talk? We are always open. We never closed our doors. They should be ready for the talks, they should be ready for the negotiations. We didn’t make the embargo on the United States. We didn’t attack the American population. We didn’t support terrorists who did anything to the United States. Actually, the United States did. We always wanted to have good relations with the United States. We never thought in the other direction. It’s a great power. Nobody, not a wise person would think of having bad relations with the United States. Question 127: But can you have a good relationship with a country that thinks you shouldn’t be in power? President Assad: No, that’s not going to be part of the dialogue as I mentioned earlier. This is not their business. We have Syrian citizens who can decide this, no-one else. Whether they want to talk about it or not, this is not something we are going to discuss with anyone. Question 128: Mr. President, thank you.